ADELINDIS, the foundress, along with her husband Count Warin, of the Reichsstift Buchau (Imperial Abbey of Buchau), in present-day Bad Buchau, Baden-Württemberg, Germany. 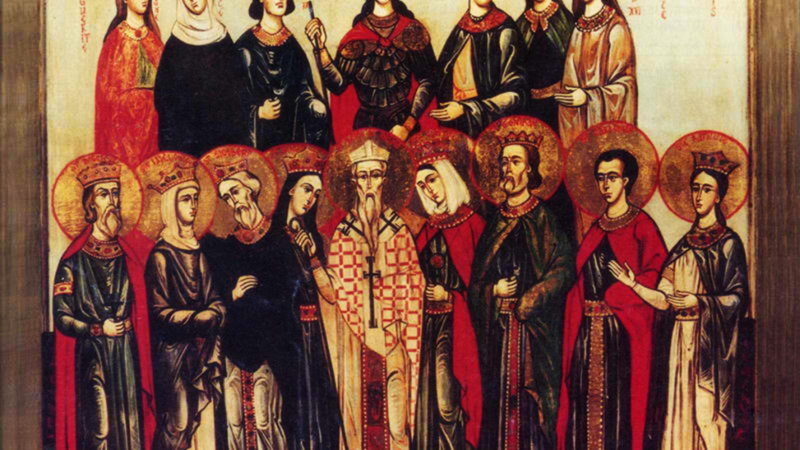 When widowed St. Adelindis entered the monastery, and may have served as its Abbess at some point. St. Adelindis reposed circa 930. AMBROSE, Bishop of Saintes for fourteen years. He reposed circa 450, and is mentioned in the Life of his successor, St. Vivian (vide infra). 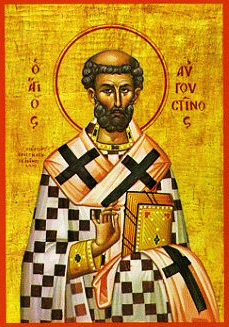 AUGUSTINE of HIPPO, born at Tagasta in Numidia, near present-day Algers, to St. Monica (27th August), he lived a life of depravity in his youth, and came very close to embracing Manicheanism. Whilst teaching Rhetoric in Milan, he met St. Ambrose (7th December), and began to attend his sermons. Through the prayers of his holy mother, and assisted by St. Simplician (16th August), St. Augustine was baptised at Pascha in 387 by St. Ambrose. St. Augustine returned to Africa, was tonsured as a monk, ordained to the priesthood (391), then in 395 consecrated Bishop coadjutor of Hippo, and full Bishop soon after. A prolific author, and staunch defender of orthodoxy against heresies, St. Augustine is a central figure, not just in Christianity, but in the history of Western thought as well. Though listed amongst other Fathers of the Church by the Fifth Ecumenical Council, (553), he has always been a somewhat controversial figure in the Orthodox Church. By his own admission St. Augustine had a limited fluency with written Greek, and it seems he used Latin translations for his study of Greek texts. This proved to be a liability, especially as he began to lay the foundation for what became the West’s concept of Original Sin, and its departure from Orthodoxy’s understanding of ancestral sin (προπατορικό αμάρτημα). St. Augustine reposed in 430 and his relics are enshrined in the basilica of St. Pietro in Ciel d'Oro in Pavia. FACUNDINUS, an early seventh century (†c. 620) Bishop of Taino in Umbria. No further information on his life is extant. FORTUNATUS, GAIUS, and ANTHES, (Early Fourth Century), according to tradition Fortunatus, Gaius, and Anthes were martyred at Salerno in Italy during the reign of Diocletian. Although they have had a very popular local cultus, their acts are of questionable veracity, and they have even been removed from some recent martyrologies. GORMAN, a monk at Reichenau in Germany, who worked to enlighten northern Europe, and lastly served as Bishop of Schleswig. St. Gorman reposed in 965. HERMES and COMPANIONS, according to tradition St. Hermes and an unknown number of companions were martyred at Rome circa 120 on the orders of a judge named Aurelia. There is no doubt that he existed, as his cultus dates from very early on. However, his Acts, and the details of his martyrdom are as fanciful as the mythical Acts of Pope St. Alexander I in which they appear. JULIAN of AUVERGNE, a fourth century martyr from the Auvergne region of present-day France. Apart from his association to several aristocratic bishops of his day, especially St. Gall (1st July) and his nephew St. Gregory of Tours (17th November), little is known of the life of St. Julian. According to tradition, St. Julian fled the persecution of Christians in his native Vienne, and went into hiding in the village of Brioude. However, he chose martyrdom over hiding and soon revealed himself to a group of pagans who promptly decapitated him. Numerous miracles have been attributed to him, beginning almost immediately after his martyrdom. PELAGIUS, the patron saint of Constance in Switzerland, all that is known of his life is that he was a youth who was tortured and then martyred in the Roman province of Pannonia during the reign of Emperors Carinus and Numeriean (283 – 285). His connexion to Constance is due to the translation of some of his relics to that city circa 904. VIVIAN, successor of St. Ambrose (vide supra) as the Bishop of Saintes. He is remembered for the great dedication and energy with which he approached caring for his flock, and his courage when facing the King of the Visigoths. St. Vivian reposed circa 460.